Can kids really thrive on a vegan diet? Sightings of vegan pizza (usually in the inner-city hipster heartlands) used to be rare. Now it's on the menu of pizza chain Domino's, reflecting the rising numbers of Australians whose diet is all or almost vegetarian. Between 2012 and 2016 their numbers climbed from 1.7 million to almost 2.1 million, according to consumer research organisation Roy Morgan, and enough people are ditching all animal foods to make Australia the third fastest-growing market for vegan foods in the world, strategic market research company Euromonitor International has found. But are these diets good for growing kids? Yes, says the US Academy of Nutrition and Dietetics, the professional organisation of dietitians in the US, which gives a tick to well-planned vegetarian diets, including vegan, for all life stages from infancy to old age. So far, so good – unless you're a parent under fire for feeding toddlers lentils and not lamb. Some people react as if raising children on a vegetarian or vegan diet is a health crisis – when the real crisis is childhood obesity. "Some people react as if raising children on a vegetarian or vegan diet is a health crisis – when the real crisis is childhood obesity," points out Amber Sewell-Green, a Sydney dietitian specialising in plant-based nutrition. "No one cares about protein until you say you're vegetarian or vegan – then everyone wants to know where your protein comes from. But adults and children can meet their protein needs with high-protein plant foods like legumes, tofu, nuts and wholegrains." 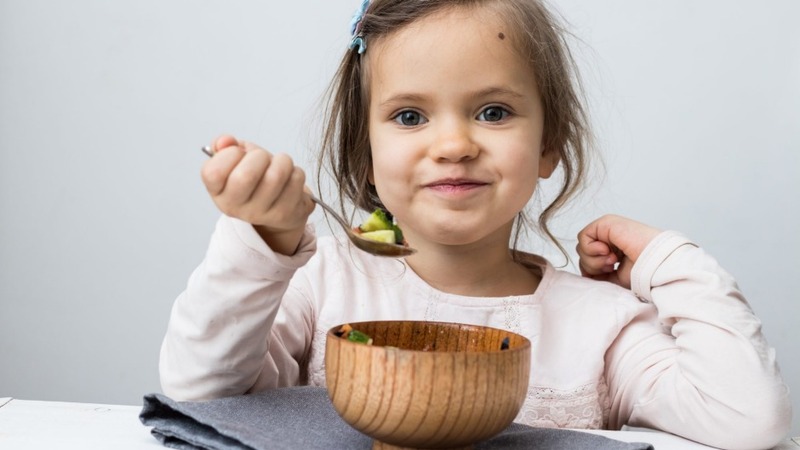 There are instances of children having health problems as a result of vegetarian diets but they're usually extreme diets such as macrobiotic or fruitarian, says dietitian Kate Marsh, co-author of a number of papers on vegetarian eating published by The Medical Journal of Australia. "But there are also benefits," Marsh says. "Some studies show that children following vegetarian diets are more likely to eat diets consistent with recommended dietary guidelines, including eating more fruits and vegetables and less discretionary foods – this can reduce their risk of childhood obesity and future chronic disease." Yet Marsh sometimes sees parents who are feeding their babies and children a vegetarian or vegan diet and doing well – but don't feel confident because other people are critical. "But there are other parents feeding their kids foods with little nutritional value and it's assumed the child is meeting their nutritional needs because their diet includes animal products," she says. That said, vegetarian or vegan diets do need careful planning, especially with key nutrients like iron, vitamin B12, vitamin D, calcium and omega-3, Marsh says. One potential problem is that many plant sources of protein and iron, such as lentils and beans, are also fibre-rich – and while that's good, the filling power of these foods can make it harder for younger kids to eat enough to meet their iron requirements. That's why she suggests including a range of iron-rich foods such as nut butters, tofu and whole grains as well as leafy greens. "It's also good to include quinoa over other grains because it's higher in iron, and to include iron-fortified cereals. Eating a vitamin C-rich food with iron-rich plant foods helps optimise absorption of iron – just 50 milligrams of vitamin C (which you could get from an average orange or kiwifruit) can increase iron absorption three to sixfold." Vitamin B12 is more tricky. It's found only in meat, poultry, fish, eggs and dairy food – there are no plant sources other than a few fortified products such as some soy milks, meat alternatives and nutritional yeast – so Marsh recommends a supplement for vegans. Vegetarians can generally get enough B12 from eggs and dairy food if they eat enough of them regularly. Calcium isn't difficult if you eat dairy food but if you're vegan, you can't just drop dairy and assume yoghurt made with coconut milk will do instead, says Amber Sewell-Green. "You need soy milk fortified with calcium. Soy is one of the best choices when it comes to plant-based milks for children – it has a similar nutritional profile to dairy. Other calcium sources are calcium-set tofu, almonds, unhulled tahini, leafy greens such as broccoli and Asian greens and dried figs." And omega-3 fats? They're in plant foods such as walnuts, flaxseed, and chia and hemp seed, but not in the same form as fish. Your body has to convert the short chain omega 3 fatty acids in plants into the more potent long chain form found in fish – and we can only make a small amount compared with what we'd get from oily fish. Sewell-Green's advice: include flaxseed and chia in smoothies, muesli or added to breakfast cereal or on vegies at dinner. Make sure they're freshly ground and stored in the fridge – and perhaps include an algae-based omega-3 supplement. The Australian Dietary Guidelines recommend not adding salt to meals for babies and young children – with family meals you can always remove the children's servings before adding salt or soy sauce to the rest of the dish. But how hard is it really for working parents to produce well-balanced toddler-friendly plant meals when it's easier to stick a lamb cutlet under the grill? "The first six months were tricky," says one 37-year-old who's been feeding her two-year-old son a vegan diet for 12 months. "You have to spend more time and energy planning and making meals but if it's something you want to do, you find a way. "I thought I should get some advice from a dietitian and my GP. The GP said there was no reason why I couldn't feed him a vegan diet, especially as he's not a fussy eater. His daycare centre also offers vegan foods – it helps that we live in an inner city area, which is open to that kind of eating. "It's been a positive experience so far and I've had no negative comments – there's been more curiosity than criticism." When parents come to see Bondi GP Daria Fielder worried that their kids are tired and irritable, lack of iron is one suspect. "In my experience, the age group where low iron levels are the most common is the toddler years from one to four, when iron requirements are high. You have to rule out other underlying causes of iron deficiency but it's often diet," says Fielder, who specialises in paediatrics and women's health. But while vegetarian kids can run low on iron, most children she sees with the problem aren't vegetarian. "Fussy eating can be one cause. I also think some parents are often confused about how to feed children because there's so much conflicting information." Then there are diets overloaded with milk – too much can reduce a child's appetite for other foods and the calcium in milk makes it harder for them to absorb iron. It's a similar story at the Children's Hospital at Westmead, where some children found to have low iron levels can be drinking litres of milk from bottles as a comforter, says dietitian Rebecca Fisher. "We recommend replacing bottles with cups and reducing milk to 600 millilitres or less a day. "Other reasons children can be low in iron include diets with too much highly processed food and fussy eating with iron-rich foods that can start at around two – the age of 'No'." The best approach? Keep offering children a variety of iron-rich foods, eat meals together so that parents are modelling eating these foods – and avoid too much grazing through the day, she says. "But low iron levels need correcting – if a child is tired, doesn't have much appetite and gets sick more often, see a GP." The Sydney Children's Hospital Network has a good fact sheet on children and vegetarian/vegan diets. Visit schn.health.nsw.gov.au. What goes in a vegan lunchbox?